While Mediterranean food is extremely popular in LA, it isn’t well entrenched in Santa Monica. 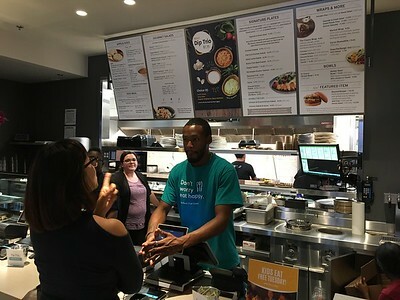 Leveraging their successful expansion in the LA area, Luna Grill recently opened up their fresh Mediterranean concept on Wilshire Blvd in Santa Monica and I attended their recent grand opening event. Luna Grill differentiates themselves from many other Mediterranean restaurants by sourcing their produce locally and obtaining meat that is preservative free with no added growth hormones. 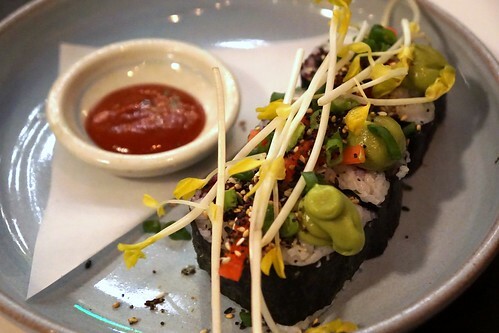 One of their principles is to serve food that avoids additives and preservatives and that is real, pure food. You can feel good about eating Mediterranean cuisine. According to the Mayo Clinic, a traditional Mediterranean diet reduces the risk of heart disease, a reduced incidence of cancer, Parkinson's and Alzheimer's diseases and has shown reduced incidents of cancer. Their research has also shown that the diet results in a lower level of LDL (bad) cholesterol. Hummus is available in regular or in a spicy version and I selected the latter. 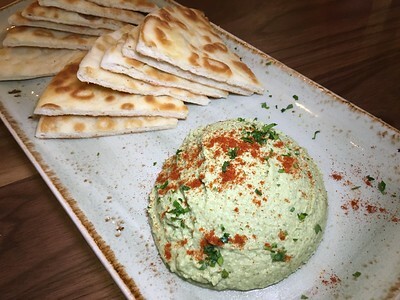 The spicy hummus is house made with a blend of chickpeas, tahini, cilantro, lemon and cayenne pepper and served with a generous amount of fresh pita slices. The addition of cilantro and cayenne pepper nicely elevates traditional hummus. 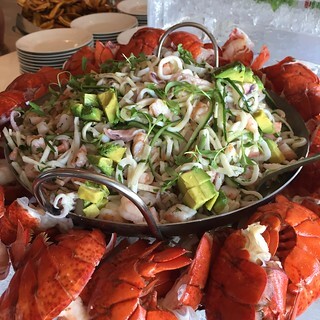 I watch for restaurant special events because it is an opportunity for a chef or an owner to execute a concept that makes them stand out above the others. 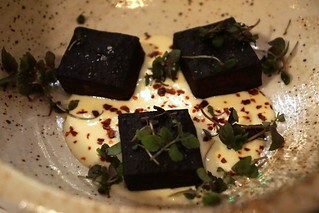 My latest discovery was Locanda Del Lago’s Morso Della Bestia or “Bite of the Beast”. The last Thursday of every month, Locanda Del Lago hosts a communal meal, featuring animal roasts and traditional, rustic Italian dishes. The Morso Della Bestia includes a 4-course dinner featuring the choice animal, and an optional wine pairing. 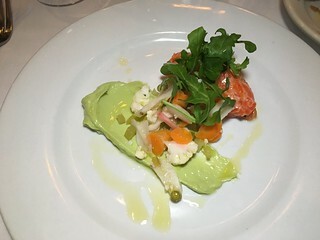 For the May dinner, the “animal” was salmon. Locanda Del Lago created a four course meal to feature this popular fish. 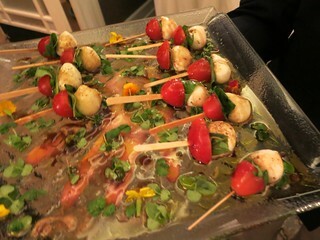 To make the event extra special, they partnered with the Italian winery, Fasoli Gino, to provide a unique food and wine pairing. The first course was a Salmon Tartare. It was surrounded by a delicious avocado puree, pine nuts, giardiniera and wild arugula. The salmon tartare was extremely fresh and creamy to the taste. It was paired with a clean tasting pinot grigio from Fasoli Gino. 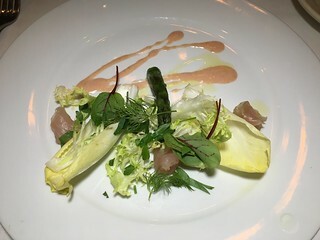 Salmon that was cured with limoncello liqueur was combined with fresh herbs, chicory and asparagus. This dish had a lot of bold flavors and I was surprised that chicory worked well with this dish. The Soave, a dry Italian white wine, was fruity with a nice amount of acidity to balance this dish. 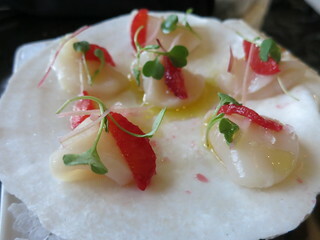 I've always enjoyed Chef Nick Erven's cooking from his previous restaurant, the now-shuttered Saint Martha. I wasn't expecting him to open a vegan restaurant in Santa Monica, but I looked forward to it just the same, especially after hearing all the glowing reviews! 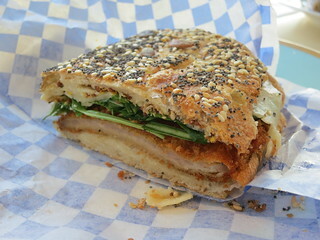 Erven is divided into two parts: the Marketplace side which serves sandwiches, cookies, juices, and such. Then there's the dining room which is open for a casual lunch, but the highlight is of course, the dinner service (although the vegan sandwiches are also great). 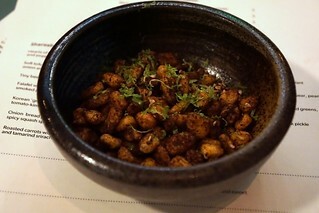 We started with a bowl complimentary fried chickpeas - the amuse bouche seems to rotate based on the other reviews. 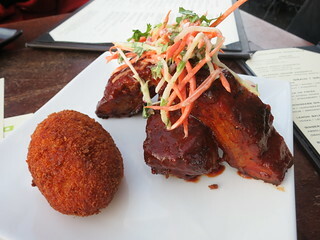 The savory portion of the dinner menu is divided into "Snackables", "Shareables", and "Principles". 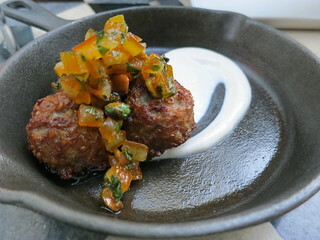 The chickpea fritter is a good way to start and gives you an idea of Chef Erven's cooking. 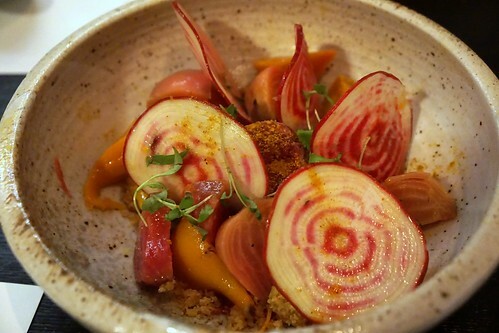 The beets weren't really "tiny" but regardless this was a wonderful and interesting take on beets, with the crispiness of the streusel, combined with avocado mousse. Sidecar Doughnuts in Costa Mesa was one of those places on my list for my few visits beyond the Orange Curtain, but now they opened another location in Santa Monica! 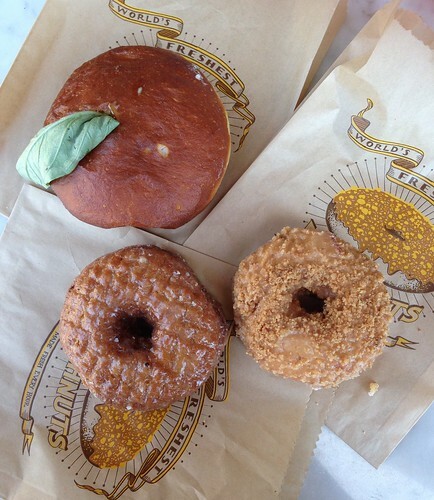 The new location is certainly way easier for Angelenos to try Sidecar's beloved donuts. When the conversation at the next table is easier to hear than the person that I’m eating with, I’m generally not having a good time. 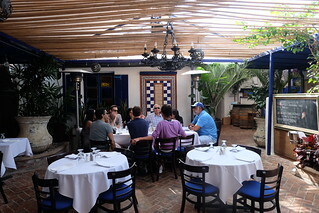 This type of occurrence has been more frequent of late because many restaurants have adopted a bistro format with small tables and uncomfortable chairs. I recently had the opportunity to visit Estate Restaurant and Bar to experience their new happy hour menu, and luckily, Estate's layout provided plenty of space to diners to be comfortable. 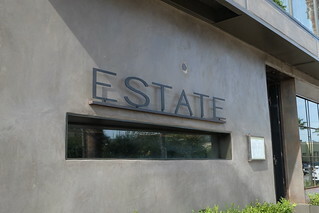 The interior of the Estate Restaurant and Bar is a modern take on what restaurants used to be like. 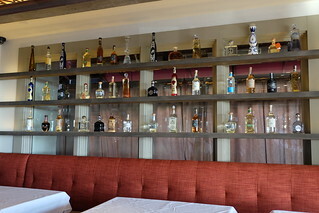 Estate Restaurant and Bar has different seating areas and plush booths and individual seats. Because they don’t attempt to use every square inch of the restaurant, there is a general feeling of spaciousness. Even the bar has cushioned comfortable chairs. 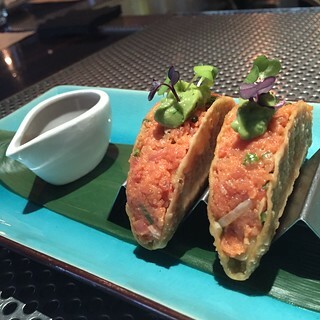 Instead of frying taco shells, they use wonton shaped like a tortilla, just like classic tuna tartar. The contrasting colors and textures were both visually stunning and delicious. The tuna was fresh and the ginger nicely enhanced the tuna. 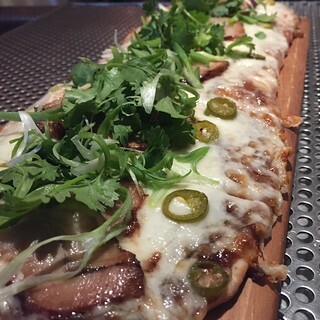 Char siu pizza with hoisin sauce? I had to see what that was all about. Driving through Brentwood on 26th Street, you would never know that a restaurant exists at 246 26th Street. The front wall of the establishment is beautifully wood stained with decorative wrought iron and grape ivy. With the absence of a sign, it wasn’t apparent that a restaurant is just behind the little door in front. Walking inside The Little Door, it’s almost like a protected oasis within the city. The covered patio area offers a lot of indirect light and you immediately feel like you’ve arrived at someone’s home. A decorative wall mounted water fountain and an abundance of greenery accentuated this feeling. The Little Door is a French restaurant and a group of us were there to experience their new Sunday brunch menu. 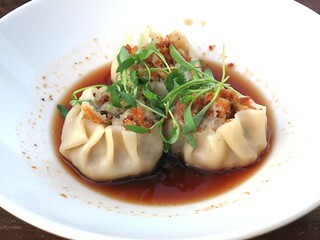 They first opened up in West Hollywood and due to popular demand, they decided to open another location in Santa Monica. 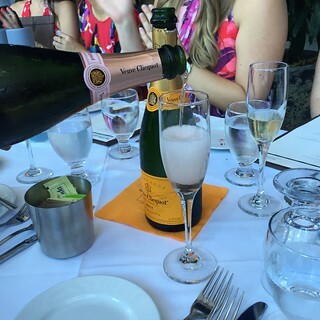 We were treated to a champagne brunch featuring Veuve Clicquot. Most champagne served in restaurants is really sparkling wine because France regulates what can actually be called champagne. 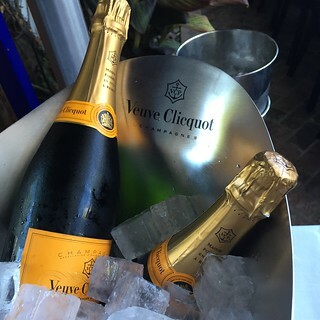 Veuve Clicquot Brut (a.k.a. Yellow Label) garnered a 90 point Wine Spectator rating and is the real deal. This is a dry champagne with hints of fresh peach. 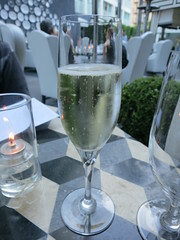 I was surprised to learn that each glass of champagne only has 72 calories. Veuve Clicquot Rosé is blended with approximately 50% pinot noir and gives it a pink hue. Wine Spectator also awarded this with a 90 point rating. I actually enjoyed this more than the Yellow Label Brut. It was a bit drier and had notes of red berries. After nibbling on the assorted Cheese, Nuts and Fruit plate, I quickly realized that sometimes the simple things are best. 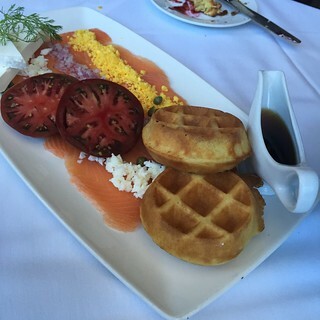 While the Smoked Salmon and Mini Waffles didn’t appear to be interesting to me at first, I really enjoyed it. The waffle was crisp and I appreciated the warm premium dark maple syrup. The saltiness of the capers with smoked salmon nicely offset the sweetness of the syrup. The black heirloom tomato was meaty, sweet and very enjoyable. Do you love cheese? 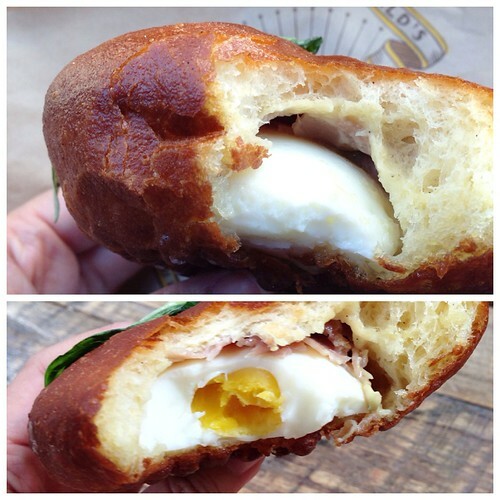 If your answer is yes, then you need to head to the new Forma in Santa Monica right away. "Forma" is what they call a cheese wheel, and this restaurant boasts four different dalla forma pasta preparations, which means that the pasta is finished off in the cheese wheel. Four different pastas, four different cheese wheels. The dalla forma pasta is not the only cheesy goodness you can get here, though. The tartare is topped with freshly shaved raspadura cheese. This is a traditional cheese of Lodi. 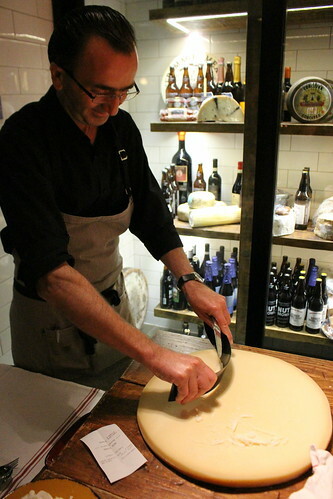 It's actually a Bella Lodi cheese that's not fully mature, and it's shaved using a special knife that bends, shown below. 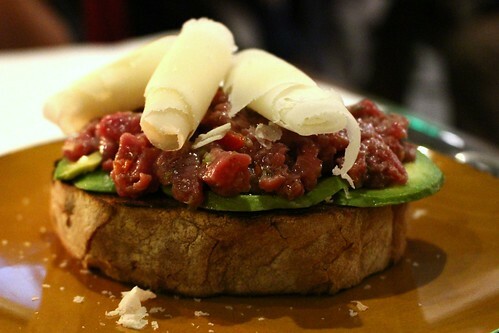 The overall effect of the bite of tartare, combined with the avocado, cheese, and grilled bread? Perfect. Forma also has a cheese bar featuring 36 different cheeses. The best part? You don't have to get a cheese platter, but you can actually order each cheese individually, so you can create your own platter, or just get the one you really want to try. I’ve participated on walking food tours in cities like Milwaukee and St. Louis and recently had an opportunity to do a local walking tour in downtown Santa Monica. 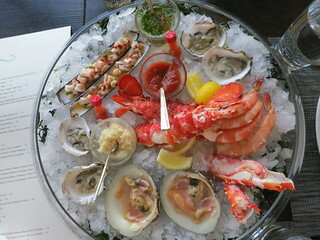 One recent evening, I had an opportunity to visit The Misfit Restaurant and Bar, Del Frisco’s Grille and The Lobster. The first stop was The Misfit Restaurant and Bar. It resides in the uber cool Clock Tower on the 200 block of Santa Monica Boulevard. 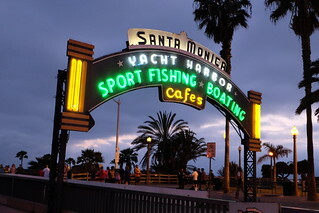 It was built in the 1920’s in the Art Déco style and is the third tallest building in Santa Monica. 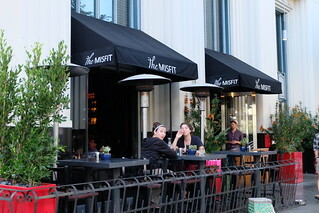 The Misfit Restaurant and Bar has a number of specialty cocktails. 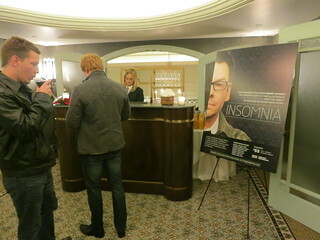 We were first introduced to “Good Night Emily”: Fords Gin, grapefruit, mint and Peychaud’s bitters. If you like grapefruit, it’s the perfect cocktail for a warm summer day. 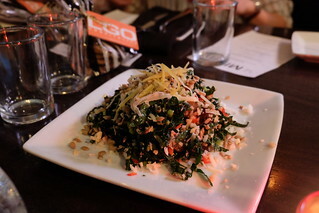 A colorful kale salad was brought out. It was comprised of shredded kale, quinoa, sunflower seeds, red grapes, preserved lemon and manchego parmesan with a champagne vinaigrette. The red grapes brought color to the dish and I particularly enjoyed the combination of sunflower seeds with the tasty champagne vinaigrette. This is a great salad to enjoy for lunch. I'm always looking for places near Toyota Santa Monica to kill time whenever I take my car in (since that Toyota location has no wi-fi). 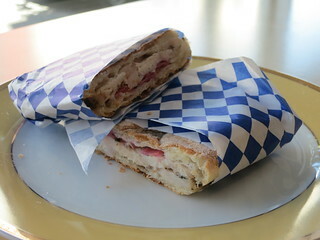 During my last service, I walked over to Broadway to the new-ish CiBOTECA, a cafe and marketplace that serves paninis, cold deli items, and desserts. Crispy veal cutlet between crunchy toasted seed bread! The annual Crabfest at The Hungry Cat will return to the Hollywood locaton on July 27! 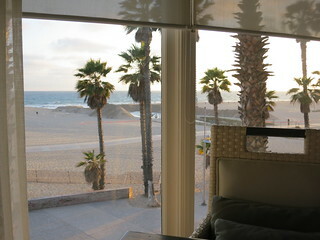 This year, the Santa Monica location will hold "Summer Crab Nights" which will be more like a mini Crabfest. The Summer Crab Nights will be held on Sundays June 29, August 10, and September 7, where you can get half a dozen Maryland blue crabs with sides of corn on the cob, tomato and watermelon salad, cornbread and a dessert for $35. The dealio is at 3-8pm on those dates. The big Crabfest (now in its 10th year) itself is $75 for 5 courses and will be at 1-7pm - again, July 27 at the Hollywood location. 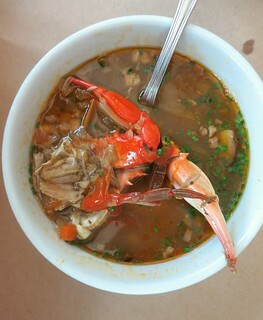 We each started with a bowl of Maryland Crab Soup, a flavorful and comforting soup with a generous serving of crab. This was a substantial sandwich for just the second course! 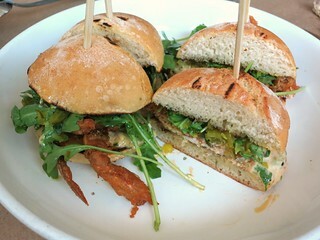 It's a well proportioned sandwich with good bread that complements the crispy soft shell crab. Realizing there wasn't really a spot for craft cocktails on that strip of Wilshire Blvd in Santa Monica, The Charleston's new GM, Chris Cheng, decided to launch a brand new cocktail list. There's no famous bartender involved, but his experience working with Beau du Bois at The Corner Door helped him create a solid starting list. 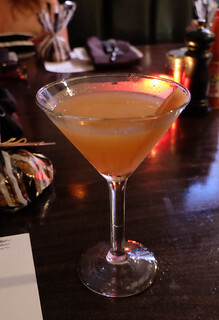 One of my favorites was the Cootie Catcher, made with gin, honeydew, luxardo triplem, lemon, and orgeat. 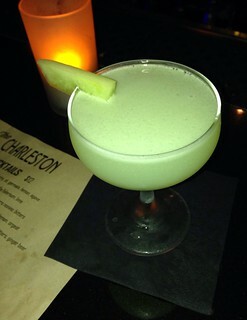 Name aside, it's rare to find a honeydew cocktail and the honeydew flavor is nicely enhanced here. The orgeat they use is St. Vincent, which is infused with orange blossom and rose water - it's a local product made by one of the bartenders at Bestia! 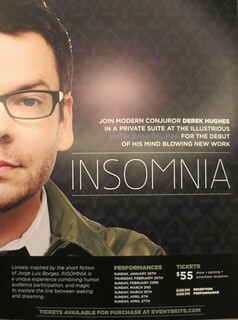 Starting on January 26, Hotel Casa del Mar will host magician ("modern conjuror") Derek Hughes for his new comedic magic show, Insomnia. ... with some hors d'oeuvres, but also parking. That's invaluable in these parts of Santa Monica! Given the price of shows in Los Angeles these days, this is quite a good price. 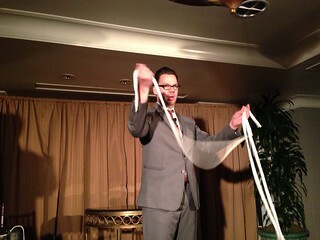 It's hard to capture a magic show with photos alone, so check out this video preview on youtube. Richard Sandoval's Zengo at the Santa Monica Place does a different "Test Kitchen" menu every once in a while, and the latest is a Peruvian Malaysian take. Malaysian food is very similar to Indonesian so I wanted to check this out! The Test Kitchen items are indicated with a "TK" to the left of the item's name on the menu. 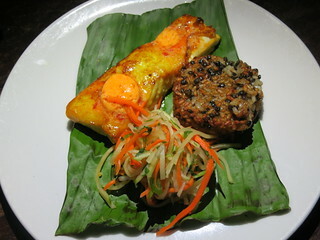 The halibut was nicely cooked, sitting atop the aromatic banana leaf, and I liked that sambal butter! It's not that spicy as far as sambal goes but definitely packed some spices. This seemed more Thai than Malaysian with the curry broth, but nonetheless it's a flavorful and comforting dish for the cold weather. The two dishes above are probably my favorites of the TK menu. Whist at The Viceroy in Santa Monica has reinvented itself as CAST, but Chef Tony DiSalvo is still going strong in the kitchen. 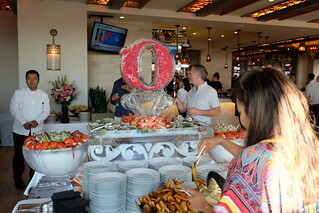 The new name, CAST, draws focus to its proximity to the ocean and the seafood dishes. Pay attention to the crostini section, and don't miss the sea urchin crostini with sea salt, lemon, and larda ($6 each). Perfectly creamy, and the light dressing of salt and lemon brings out the rich flavors even more. 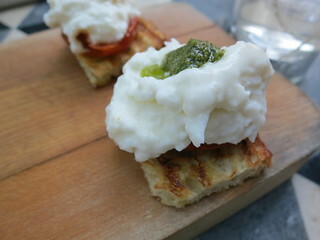 Equally worthy but less of a splurge is the burrata crostini with pesto, tomato ($3 each). This was also one of the creamiest burrata I've had in LA. 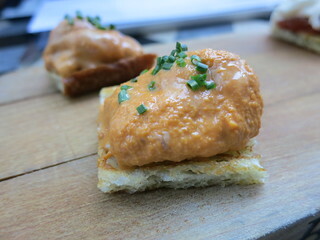 The crostinis are thin, meant to serve as a vessel to the uni and burrata without masking the flavors. 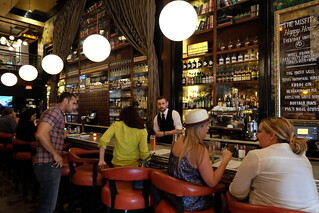 Oh, if you are on Instagram, be sure to take a photo and tag @viceroySM. You will get a free glass of sparkling wine for doing so! For a glass of white wine that will go with seafood dishes, we enjoyed the 2010 Supernatural Sauvignon Blanc, Napa, California ($13). 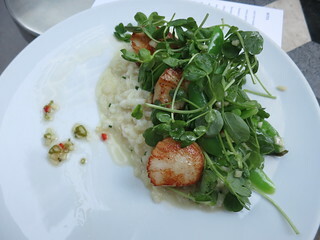 Perfectly cooked scallops, creamy risotto with chunks of sweet crab, crisp snap peas. 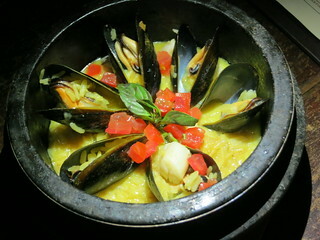 What a nice seafood dish, the flavors are light yet satisfying. This was quite an interesting combination. The dumpling skin was nice and thin and while there were traditional Chinese flavors here, the mofongo was very distinctive. Live and Dine LA is Angeleno Magazine's celebration of their Restaurant Issue, and it's always one of my favorite events, featuring LA's best restaurants at the beautiful Fairmont Miramar Hotel and Bungalows. This year's event will start at 4:30 pm on Sunday, July 21. 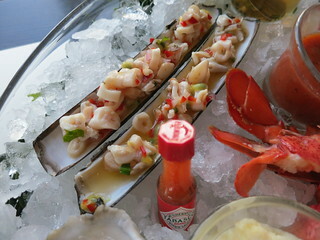 Tickets are $95 and can be purchased on http://2013liveanddinela.eventbrite.com/. This year, the VIP ticket gets you two nights of extravaganza. The $250 VIP ticket (can be purchased here) gets you a four-course dinner made by Chefs Ray Garcia, Michael Voltaggio, and Ricardo Zarate with wine and cocktail pairing, and also admission to the main tasting event on July 21. Chef Ray Garcia from FIG served nose-to-tail pork tacos, displaying this impressive bowl of just that.